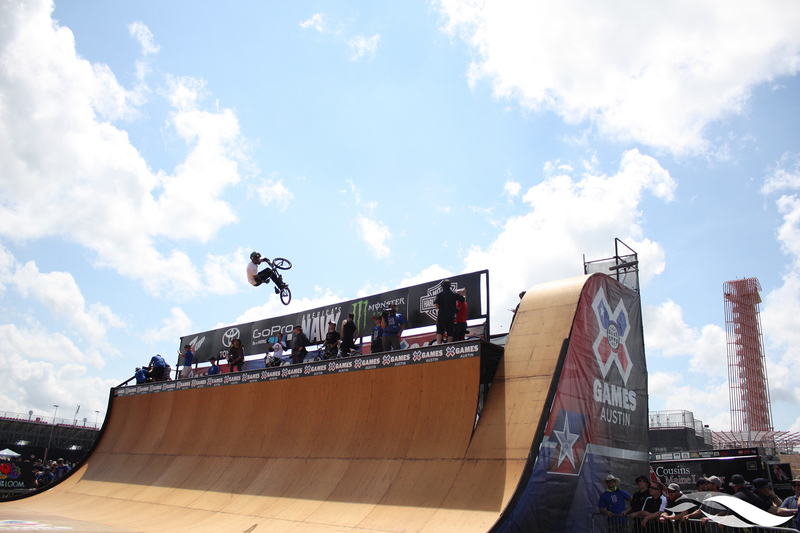 On day two of X Games Austin 2015, crowds streamed into Circuit of The Americas ready to watch an action-packed day of competition. Friday kicked off with seven-time X Games medalist Vince Byron unseating nine-time BMX Vert gold medalist Jamie Bestwick in BMX Vert, ending the longest winning streak in X Games history. Byron took the lead in the first round nailing a 540 flair, a trick that’s never been accomplished before in X Games history. Bestwick answered back with a silver medal worthy run and Simon Tabron earned his second-consecutive and eighth X Games bronze. Byron now has four medals in BMX Vert, with today’s win being the first X Games gold for the 25-year-old competitor. Pierre-Luc Gagnon dominated Skateboard Vert, landing in first place and holding the top position throughout the three run final to earn his seventh gold medal in the discipline and his first Skateboard Vert gold since 2012. Gagnon relied on his combination of consistency and technical tricks to claim the top spot. Silver and bronze went to first-time X Games medalists and UK athletes, Paul-Luc Ronchetti who took silver and Sam Beckett who earned the bronze. In a hotly-contested Toyota BMX Park final, the fluid concrete course brought out the best in the field of seven BMX competitors, battling it out through finals. Daniel Sandoval put together a rapid-fire run of technical tricks, including a front-flip flair, on his final run to overtake seven-time X Games medalist Dennis Enarson. This marks the first X Games gold medal for Sandoval, who earned bronze medals in BMX Park at the last two X Games. Enarson put down his highest score on his second run to earn a silver medal. Three-time X Games gold medalist Scotty Cranmer took the final podium spot with a bronze medal. Defending gold medalist and Austin, Texas, native Chase Hawk finished in sixth place. Mike Brown took the gold in Men’s Moto X Enduro X, strategically working his way into the lead position early on. Brown took the lead from Cody Webb after he took a fall in the rock corner. Brown then proceeded to put some distance ahead of the field, finding the flow of the track. This is the third X Games gold medal for the 43-year-old athlete. Following close behind, Taylor Robert also found an opportunity to get ahead of Webb airing over the tire jump and into the silver medal position, Webb ultimately crossed the finish line in the bronze position. Returning to X Games competition after taking a year hiatus, Laia Sanz reclaimed the top spot with her fourth gold medal in a hard-fought battle in Women’s Enduro X. Eight-time gold medalist Tarah Gieger gave Sanz a run with the duo alternating positions throughout the race. Sanz ultimately pulled ahead after negotiating a clean line through a pileup in the rock corner and gaining distance in the technical sections. Gieger kept well ahead of the field airing through the doubles section and into the silver medal position. A huge day of competition wrapped up with America’s Navy Skateboard Big Air in front of a massive crowd of spectators. Bob Burnquist took the lead early, landing a switch 540 over the gap into an Indy 700 landing fakie on the quarterpipe and earning the night’s high score of 93.33. This win makes 28 X Games medals for Burnquist—the most in X Games history. 2014 defending gold medalist Tom Schaar was the next to put down a solid run with a slow-spinning 720 over the gap to a 900 on the quarterpipe, but Elliot Sloan quickly knocked 15-year-old Schaar into bronze medal position when Sloan landed an Indy 7 to a massive tailgrab 900 21.2 feet above the quarterpipe to take silver. 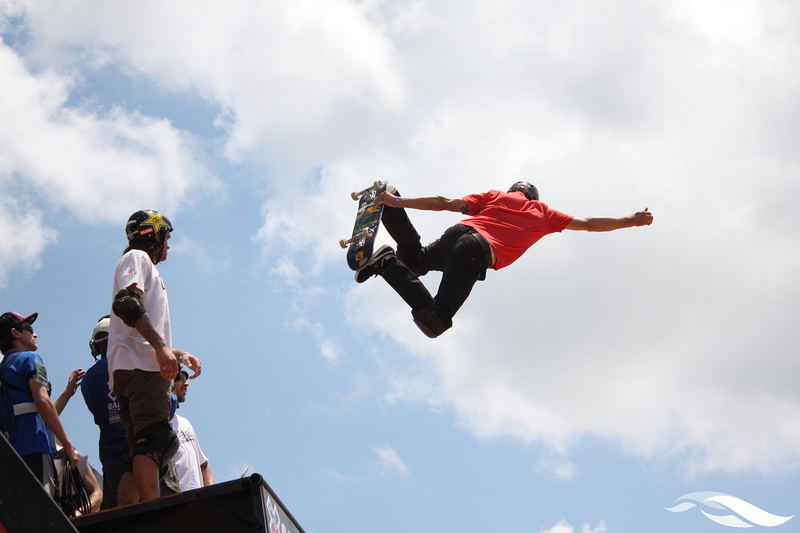 X Games Austin continues tomorrow, Saturday, June 6, at Circuit of The Americas, featuring Toyota Skateboard Park, Off-Road Truck Racing, Skateboard Vert Best Trick, Monster Energy Men’s Skateboard Street and Moto X Best Whip finals. Fans will also be entertained onsite by musical acts including Talib Kweli and Kid Ink at the Sound Factory stage. The night will close out with headliner Metallica on the Super Stage. Please visit www.xgames.com for full schedule information.